On 28th March 2019 we held the first Spring Concert at Newton Farm School, run by musical director/co-ordinator Miss Smith. The evening’s purpose was to raise money for the music department to buy new instruments for September. The evening had a varied program from choir, boys chorus, girls chorus, solo performances and orchestra. The event was a success and the music department was thriving with great performances. The evening showcased all of our musically gifted children from year 2- year 6. These showcases will become a regular occurrence as performance is such a big part of being a musician and great for building confidence. Miss Smith was very proud of all the children involved and is always striving for excellence when teaching music. Performance highlights include Advik – Allegro on Violin and Aarnav – Indian vocal number. The orchestra re-auditions have happened on Monday and 6 new children will now become part of our orchestra here at Newton Farm. We look forward to the summer showcase! On Monday 1st of April, I went to the Royal Academy of Music for an audition. This audition would decide whether or not I would obtain a place in the Junior Academy, the branch for pupils entering at the age of 11. It started off with me playing two contrasting pieces, Sonata NO. 15 K545, which was a piece written by Mozart. Then I played Canon in D, a slower piece written by Johann Palchabel. After this I was asked to complete a sight reading test where I had to learn a short piece and then complete an aural test which tests your ability to listen and review music. Overall the audition was really good and went really well. I hope I am able to get in. On 26th March Miss Smith took 5 children to take part in HMS (Harrow Music Service) String Festival at Harrow Arts Centre. The girls had been practising the songs for the mass concert within their peripatetic violin lessons at school. They arrived at 9:30am and the rehearsals went on until 3:00 pm. The girls showed a great deal of maturity and concentration and by the end of the rehearsal the show was ready to go. 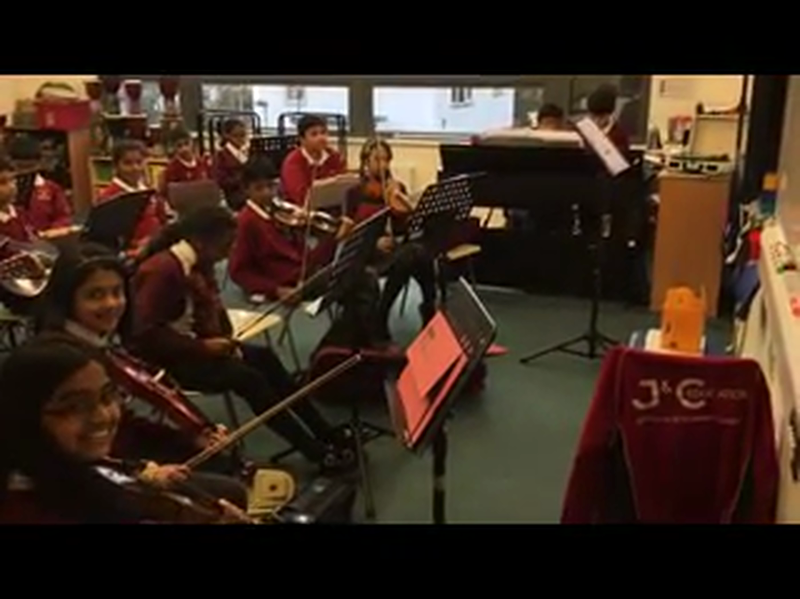 There were over six schools present and over 100 children playing violin alone. The standard of the concert was brilliant and it was yet again fantastic to see so many parents supporting their children’s music learning. We were even lucky enough to hear Miss Mckay (Violin Teacher) play with the staff band! The favourite number for all the children was ‘Shake, Rattle and Roll’. Next year we hope to have more children attend the string festival, so please encourage your children to practice their instruments, especially Years 3 and 4! Miss Mackay is very impressed with the girls, having taught them for a couple of years now. She is always looking for excellent progress from her violin lessons and the children really enjoy her fun approach. Last week they undertook a spy mission involving theory and playing tasks and challenges! 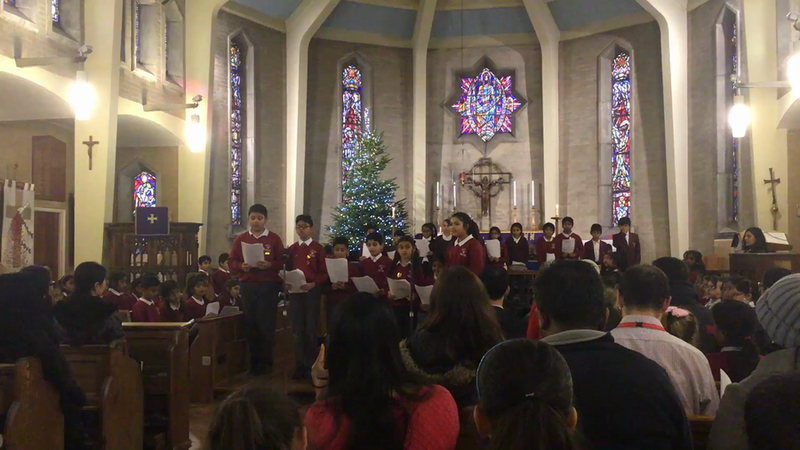 “Last week, the school choir had the amazing opportunity to go to the Harrow Arts Centre with lots of other schools to perform in a mass concert. The schools included were Stanburn, Pinner Wood and Glebe Primary. We were really excited about performing in the concert. At the beginning we were shown to our rehearsal room (The Weald room which was in a separate building, where we began rehearsing. We shared this room with Stanburn l and played and performed with each other until our scheduled rehearsal time. After that we moved to the main hall where we would practice transitioning between songs/schools and singing our mass piece ‘I wish I knew how’. Then after a lengthy rehearsal we were set for the parents to arrive. We sang two songs ‘Stand By Me’ and ‘Lean On Me’. It was lovely to see so many parents supporting our choir here at Newton Farm. The children sung and played beautifully leaving Mr Bradley, Miss Smith, Miss Bouraeza and Miss Pindoria very proud. Aarnav is a budding composer and is always trying to find as much to do with music inside and outside of school. He has used an online program called Crescendo to compose his latest tune called 'In The Rain'. He was given a head teachers award sticker and everyone in assembly listened intently. Please enjoy listening to the composition . . .
Year 6 are working towards writing for the Orchestra. Since Key Stage 1 they have been learning about musical notes and rhythms. They have been learning in depth about classical music and reading and writing scores for the orchestra. By the end of this unit they will have a second neat draft written up of Beethoven's 5th Symphony. The children have an advantage as most Year 6 are in our orchestra here at Newton Farm. We are hoping for a composition for the orchestra from a child. If your child is interested in writing a song to be played by the orchestra in the Summer Showcase then please do not hesitate to encourage this! One of our orchestra violinists played at her cousins wedding over the half term. Very proud moment for her parents! Doing music related practice or performance outside of school is essential in keeping up standards in the orchestra. This student has secured herself first violin. If your child is doing something musical outside of school please don't hesitate to send over video or photos of the event. We would love to hear them! We are working hard rehearsing for our spring concert where we will be playing 'Canon in D' and 'Ode to joy'. Please enjoy our rehearsal videos . . .
We have been looking at musical notes and writing music in nursery this term. Writing music is really important to help children understand music when it comes to them playing and learning an instrument. The boys will be rehearsing weekly to prepare for our spring concert coming up. We have been preparing two pieces ‘Lean on me’ and ‘Stand by me’. We are very much looking forward to their debut performance! In Years 2 and 3 we have been working on major and minor scales. We have been learning to change from one to the other. Below you can see Year 2 working on C minor and Year 3 working on E and D major. I have started a Key Stage 1 enrichment club to help the younger children to learn to read and write music. My aim is that the children will develop their understanding of music ready for instrumental lessons from HMS in year 3. They learn to write a part of the song and then play it on the glockenspiels. At the end of the club we a do a quiz to see how much we have learnt. I am already really impressed with their progress, very much looking forward to seeing how good their notation writing skills will be by the end of the year! Two of the gifted and talented students in music have showed interest in teaching. They had planned and delivered a lesson in music writing to our nursery children. These skills are so important to any musician as it is inevitable for them to teach at some point in their career. They both performed exceptionally well and we were particularly impressed with how they spoke to children, simplifying sentences down and picking key information out to help them learn. 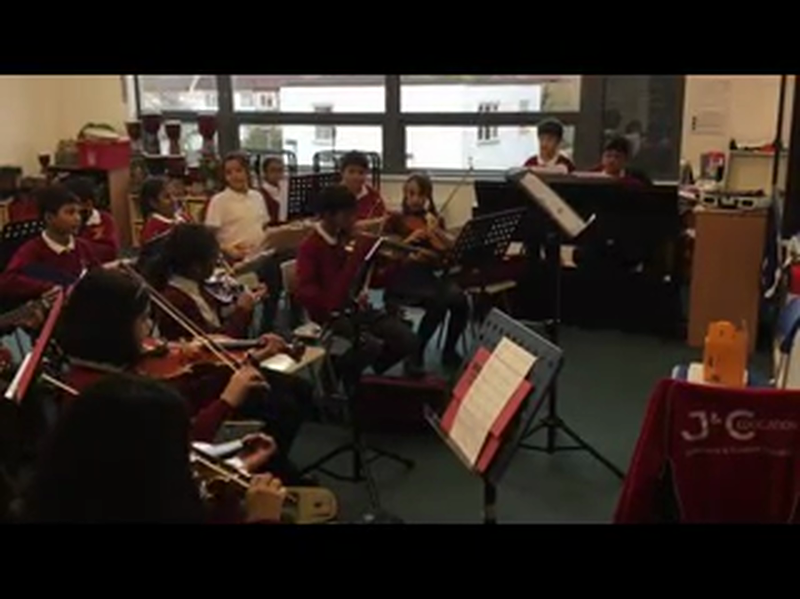 The string ensemble are seen practising two pieces ready for our spring concert coming up. They have been seen to be playing with lego too, which is a fantastic way for children to learn and understand major and minor scales. This group will be going to the string festival with HMS in the spring term. Music gifted and talented students have been helping the nursery children to draw their notes. This is a brilliant opportunity for up coming musicians to have a head start in teaching younger children. Teaching music is always going to be a required skill of any musician, so this workshop with nursery will definitely have boosted confidence in skills other than playing and theory. By the end of the session a considerable number of nursery pupils could draw middle C.
Our first mass showcase in the church with both the 60 strong choir and 30 orchestra. The programme was varied with solo, ensemble, vocal, instrumental and mass performances throughout. The children's hard work an enthusiasm for music shone through in this wonderful family event. From 'The Holly And The Ivy' to 'I Got rhythm' the children thoroughly enjoyed the performance and we had a massive turnout from parents supporting them. 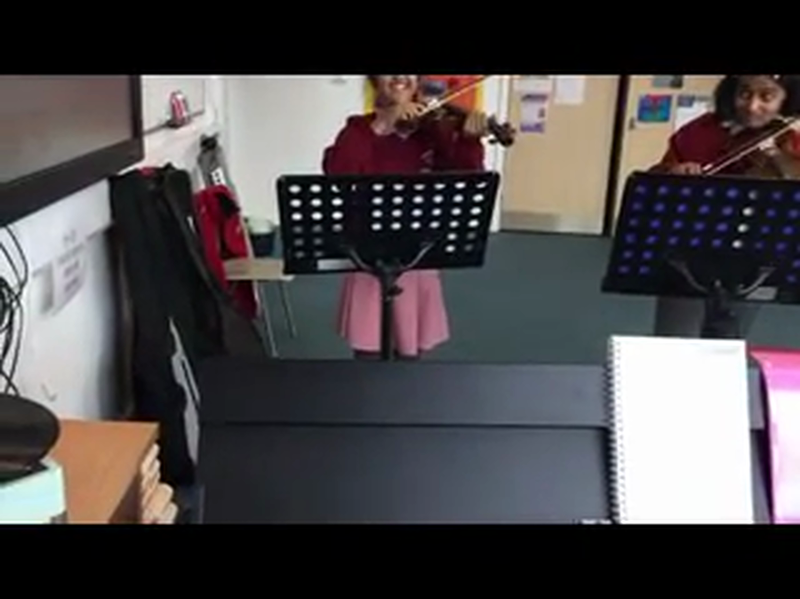 The standard of the orchestra playing their party piece 'Ode To Joy' a Beethoven number, was really good and will only keep improving throughout the academic year. The orchestra resonated in the church giving a massive finale piece to finish on with the choir filling up the church. Our winner of the 'Christmas, Composition, Competition' played their Christmas No.1 and will shortly be getting recorded. Miss Smith is always encouraging children to be creative with their own material and this was taken on board by two boys who merged their songs together to create a ballad, so they just had to be the winning entry. Lots of other entries were of a high standard too, the children had put some time into making their lyrics fantastic to listen and read. And some of them had even written out the notation for their instrument melodies too. In music gifted and talented we have been working on our grade 3 or grade 5 theory knowledge. I set them homework over the Christmas period to do a test paper and am extremely impressed with how quickly the children have progressed. Having marked their test papers I look forward to letting the parents know of children who will be ready to enter an exam this academic year. With more than 5 of the music gifted and talented students achieving a distinction in their theory mock! I have started up a music gifted and talented group at Newton Farm School, as we have so many high achievers in music. Our aim is to encourage relevant pupils to enter a theory exam, ABRSM grade’s 1-5 next year. The grade 5 theory qualification can be used on children’s UCAS applications for their future years, hopefully as musicians. Please see below a Y6 pupil reflection . . . The choir is 50 children strong, we will be rehearsing every week. In choir we will be working through many genres, but to start this term we have been working on a jazzy number, a George Gershwin piece called I got Rhythm. We’ve been working on 2 part harmony and will be showcasing this in our performance in the church on 14th Dec St Andrews church. Along with Christmas numbers, hymns and carols. As you all know I was super keen to start up an orchestra at Newton Farm, we’ve had 3 week of trials, with 67 children volunteering themselves forward which is fantastic showing how eager Newton Farm are to become musicians. The players for orchestra have been finalised we will be working towards joining the choir for a few numbers for our Christmas Carol Concert on 14th Dec. We will showcase a piece we have been working on in orchestra too, ‘Ode to joy’. Peripatetic music teachers from HMS take groups of children to have lessons in violin, steel pans and guitar. Any children who are doing really well on their instruments get chosen to play in our award assembly on Friday’s. Music Reading and writing club have been looking at lots of different pieces. Every week we go over the cleff, key signature and time signature first and then we start to draw our notes. We have a street we draw out that helps us to remember where the notes sit. If a note is sharp or flat we colour in a window in the house either on the left or on the right. If we are playing a piece of music it is important to know what key it is in and if that key is major or minor. The children will be able to work it out looking at the notes that make up the tonic chord. We have been looking at quite a few different pieces including star wars, harry potter, oh when the saints and Havana. Each week they write a small section of their music and the rest is printed out for them. We have a budding musician in Year 6 who played/sung Galway Girl as we walked into assembly. Year 6 have been working on STOMP the musical. For those of you that don’t know stomp is a west end musical based all around a junk band. Year 6 were set the task of using 3 different types of physical rhythm. Singing, body percussion and junk instruments which they made at home. The piece of body percussion the class came up with was to a very high standard and after much practice came together beautifully in our showcase assembly. The piece consisted of three different rhythms played by three different groups, which they had composed and notated themselves, they build up everytime a group/rhythm is added. So effectively it sounded like a human drum kit. Year 2 have been working on rhythm aswell using and introducing musical notes. We did this using musical ducks, we had grandad duck for 4 beats mummy duck for 2 beats, teenager duck for 1 beat and baby ducks for our quaver beats. After these were introduced we have begun to read music as a class recognising the musical notes and the lines or spaces they sit on. The classes both performed as a collective using their bodies and instruments. I am super impressed with year 2 and their ability to play in time to the beat. We did our performance to Bruno Mars – Uptown Funk, and it was a hit.